The man overboard (MoB) is one of the most serious emergency situations, that one can encounter on a boat. Earlier this year I blogged about safety issues and wrote how we are going to re-think our routines and go through every safety equipment that we have onboard, re-evaluate their placement, check their condition/expediency dates etc. The MoB recovery gear is a good place to start this process, as it clearly needs to be up to the task. In addition to revising the condition and placement of the MoB equipment, the question is, what gear one should carry onboard. First of all, this depends on your sailing area. Especially in the Baltic Sea area, it is common that MoB equipment pretty much equals the traditional horseshoe buoy and a throw line. For example in Finland, this is the minimum requirement if you want your boat to be registered in a sailing club. Dolpin Dance had that kind of a setup when we picked her up from Denmark in 2010. On the other hand, when watching for example British or Dutch boats, which have crossed the North Sea on their way to the Baltics, one notices the heavier safety gear, that they often have onboard. Our old foam horseshoe lifebuoy, which came with the boat, was pretty crappy and worn out, so we decided to replace it with a rescue sling in the spring 2011. In general, falling overboard is probably most likely to happen in rough conditions where everybody on board should be wearing lifejackets. Therefore, in a MoB situation I would consider a lifting device more useful than just a buoyancy aid. Naturally, the optimal solution would be to have both ready to be deployed in the stern rail, but in a small boat with a rather narrow transom, the pushpit tends to be already full of various stuff. 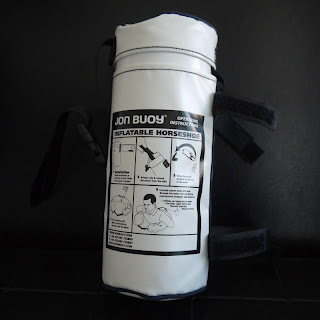 As in 2011 we had to make the choice between the lifebuoy and the rescue sling, we decided to opt for the latter, because the sling — contrary to the traditional horseshoe buoy — can be used to lift a person overboard back to the boat. Basically, it's design and operation is pretty similar to the sling, which is used in helicopter rescues. 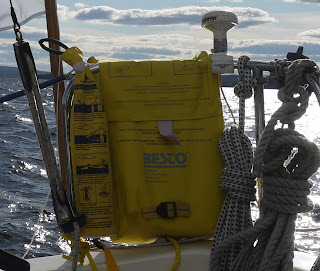 One good tip, that I came across when reading discussions on the subject, was to glue reflective tapes to the sling, which help in towing the sling to the person in the water at night. Unfortunately, few manufacturers have those since new. The rescue sling works also as a floating device and our boat club's inspector did accept it as a replacement for the horseshoe lifebuoy. 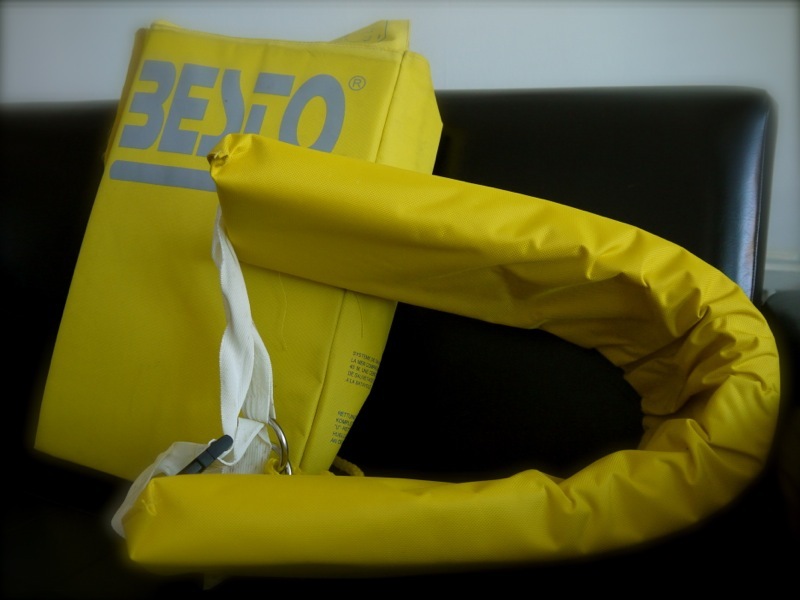 However, one problem with the rescue sling may be that it needs to be attached to the boat; for example our Besto sling has a 40 meters floating line (one has to just remember to tie the other end to the boat!). This might be a very useful feature, since the person overboard can be pulled aside the boat, when he/she has caught the sling. However, there may become a situation, where one would need a floating device, which can be thrown freely to the person in the water. Furthermore, when thrown immediately overboard, the lifebuoy marks the location of the MoB incident. This is vital especially at night (the lifebuoy should always have a light, which activates in the water). 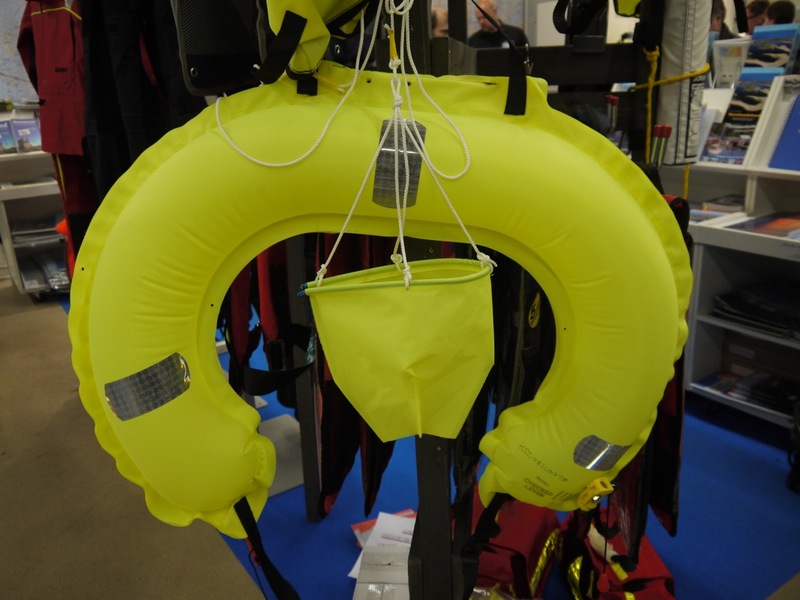 One smart solution especially for small boats is an inflatable lifebuoy. On the previous weekend, when we visited Meri Kutsuu -boat show, we came across this kind of equipment and decided to buy a Jon Buoy inflatable horseshoe. 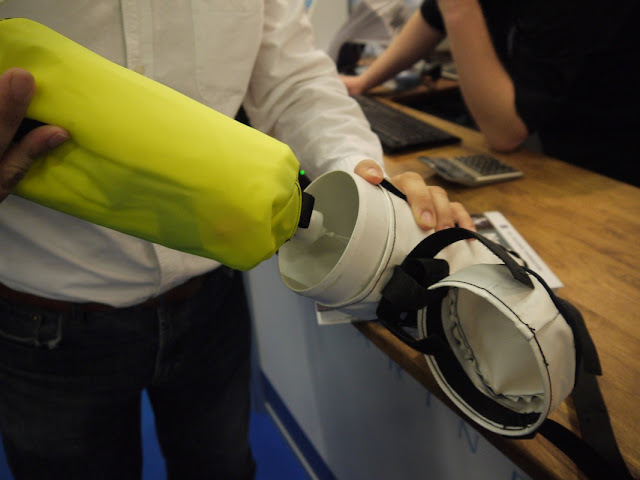 It's operation is similar to the inflatable lifejackets: upon contact with the water, the lifebuoy inflates automatically. When packed away, the lifebuoy is very compact and can be easily mounted in the stern rail. Especially, if heading for the bigger waters, one should also consider having a danbuoy, which is basically a floating long signal pole with a flag and light. This improves the visibility especially in the bigger seas. There are inflatable or telescopic danbuoys on the market and also packages, which combine the lifebuoy and the danbuoy. We will consider adding a danbuoy in our MoB equipment in the future.